This sleek bracelet watch from luxury Swiss watchmakers Tissot combines sophisticated watch technology with contemporary styling. Boasting both a polished and matt finish, a shimmering mother of pearl dial adds a dash of feminine elegance that contrasts to the subtle element of sports inspired design. Complete with chronograph, date function and tachymetre. 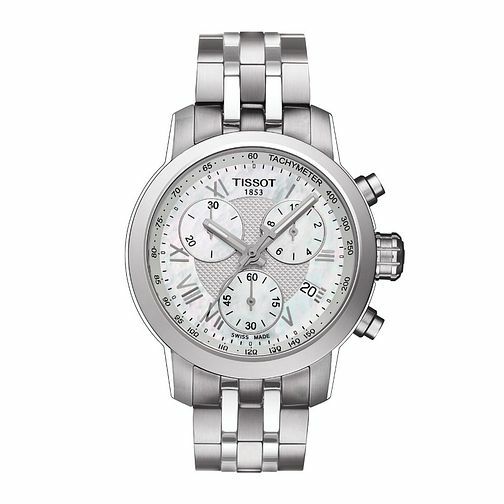 Tissot ladies' stainless steel bracelet watch is rated 5.0 out of 5 by 4. Rated 5 out of 5 by Anonymous from An elegant gift I’ve bought this watch for my partner as I find out what she likes when we were browsing. I find this watch so luxurious beautiful and comfortable as she described also very catchy as her colleagues asked about it. Good price as well compared with other retailers almost £100 cheaper. Highly recommend. Rated 5 out of 5 by Anonymous from Very happy! Given as a valentines present to my wife. She's extremely happy with the watch! Great service and super fast delivery. Have used Ernest Jones before and would again.